I am one of numerous fans of strobist. I use fill-in flash outdoors quite often, on-camera or on extension cord. However I wanted more freedom and flexibility (as I wanted to start doing more advanced things) so I started considering wireless (radio) triggers. If you read my blog regularly you must have noticed that I am in favor of low-cost solutions when they provide good quality results. So triggers like Pocket Wizards or other brand name were out of question for me. Reading Strobist and flickr forums I found that Cactus V2s is a very reasonable option. So that was my starting point. Checking eBay for Cactus I found similar, but slightly different triggers from YongNuo. According to flickr discussion it’s slightly improved version of Cactus from another supplier. The case for receiver is exactly the same for both, and both use the name PT-04. Transmitter seems to be slightly different. I am not sure whether the circuit of YongNuo is really better than Cactus but most important is that it uses more convenient batteries. 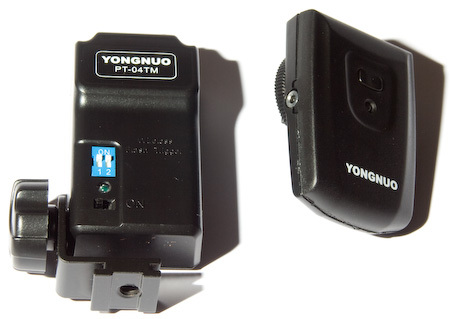 Instead of rather expensive batteries in Cactus, the YongNuo device uses 12V A23 battery in transmitter (which is $1-2) and 2x AAA batteries in receiver. I ordered a set from Hong Kong eBay seller John Camera Store (ebay id copijohn). It took less than a week for parcel to arrive from Hong Kong. You can see on the picture above how the transmitter and receiver look like. They feel plastic and not very sturdy, but in fact they aren’t too bad. When I tried using them, they worked flawlessly. Remark: I’ve read in many forums about Cactus triggers missing the shot. So far I have only made a few quick tests with YongNuo so I don’t know how will it behave in real shoot and at longer distance. But with my limited tests I noticed that I need to insert the transmitter in camera hotshoe quite firmly, otherwise it will not work. Once it is sitting well in place I didn’t see any missed shots. There is one problem I found that is associated with this purchase. However the problem isn’t with the trigger but with my Sigma EF-500 DG Super flash. Traditional/old/non-TTL flash units use one central contact on the hot shoe for triggering the light. Modern electronic TTL flashes have several additional contacts – different for different brands (Canon, Nikon, Olympus, Sony/Minolta). 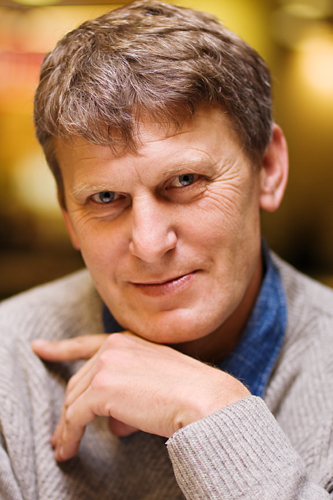 Most modern flashes can still be triggered by central contact while in manual mode. This is used by universal third-party external triggers. Apparently Sigma EF-500 DG Super flash only triggers from central contact while in manual slave mode (at least the Canon version). In any other mode it needs all hot-shoe contacts to be connected to Canon camera. In general this is not a big problem, as I still can manually switch the light output in this mode. It is a bit annoying that AF assist LED is constantly blinking in that mode, but this isn’t really critical. However the bug (or “feature”) I found is that the unit continuously generates multiple flashes in this mode as long as central contact is connected and charged capacity allows. It means that in full power I get just one flash (because recycle time is longer than the central contact is triggered), but at lower power (1/2, 1/4, etc) I am getting 2-3-4 flashes instead of 1. Searching in the internet I found few other people complained about the same issue. Writing to Sigma technical support in the UK and in Japan didn’t give any result (“thanks for your email, but we don’t know about that”). There is one idea how to solve the issue – the “Test” button generates only one single flash, so soldering external sync port to “Test” button contacts could be the solution. I haven’t tried it yet because it doesn’t seem to work well. I found one person who tried that with a cheaper (but very similar) Sigma EF-500 DG St and he told me there is some delay in flash triggering via “Test” button, so it is only possible to use with with shutter speeds like 1/30-1/40. Adding external sync: discussion in POTN forum. 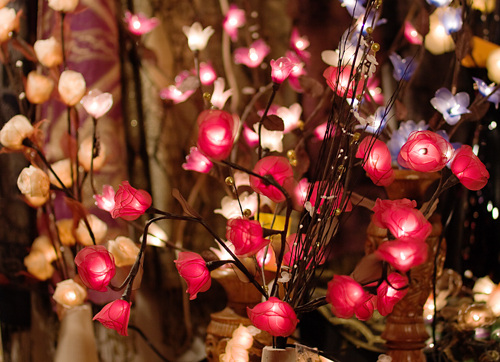 And, there was a discussion on photocamel forum about multiple flashes. For the time being I will only use my Sigma with radio trigger in full-power; or I will use my other strobes – I have two old thyristor units that I bought on a flea market. I have been thinking about an external battery for my flash for quite a while. 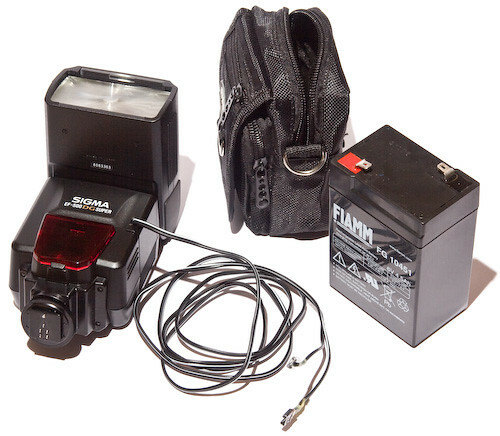 My main flash (Sigma F-500 DG Super) doesn’t have a high-voltage power connection, and anyway high-voltage batteries are rather pricey for my not so often use… So I haven’t done anything with that until I found the post on shutterbug.net last week. 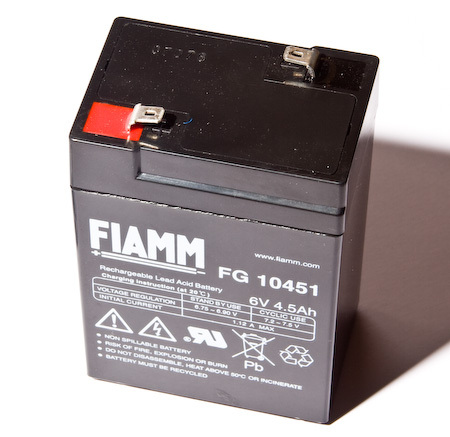 In the nutshell that post explains that using external low-voltage low-cost high-capacity sealed lead-acid battery (6V 4-4.5Ah) helps to reduce re-cycle time significantly for many flash models. While I didn’t see such batteries in the shops in my neighborhood there were plenty available via ebay, with the price around 10 Eur (plus delivery). So I ordered my battery last week. Incidentally there was a post on Strobist on the same subject just the very next day after I ordered my battery. While the main post was about high-voltage batteries, the reader’s comments discussed low-voltage option as well, and there was reference to the same shutterbug post made in the comments. I have bought 6V 4.5Ah lead-acid battery (about 20 Eur including delivery). It charges my Sigma EF-500 DG Super for ~1.5 sec at full power (vs ~6 sec from AA batteries). My old manual thyristor National flash (pe-3066g) also charges much faster than before (around 3.5 sec). I bought a little bag for 3 Eur that just perfectly matches the size of the battery; and I spent 2 Eur for the contacts in car accessories shop. I found some wires at home, so I soldered the contacts to the wires. Also I spent about 20 Eur for charger, but any AC/DC transformer or motorcycle charger that can produce 6.5 V 1.5A current will do the work.